I had an amazing time yesterday. 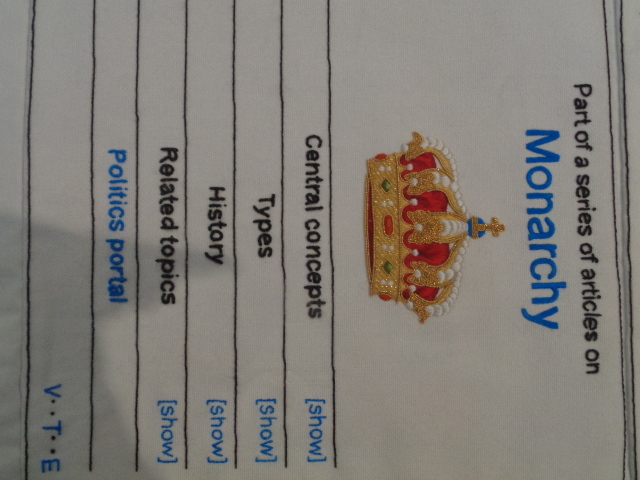 Now a visit to the British Library on the hottest day of the year so far, does not sound like an appealing prospect. 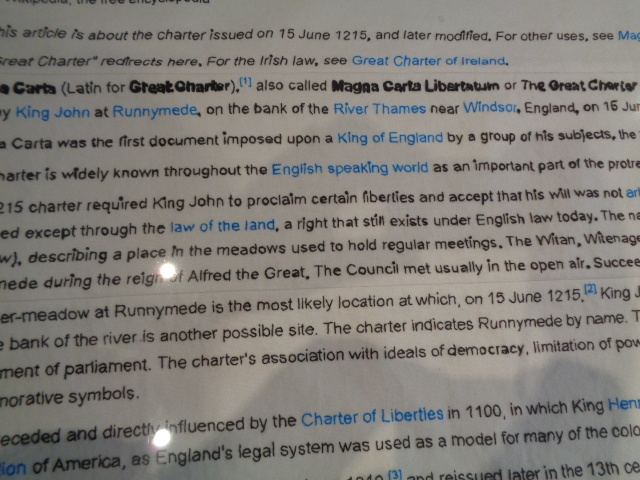 But I was entirely wrong and I recommend a visit to see Magna Carta (An Embroidery) before the exhibition closes on 24 July 2015. 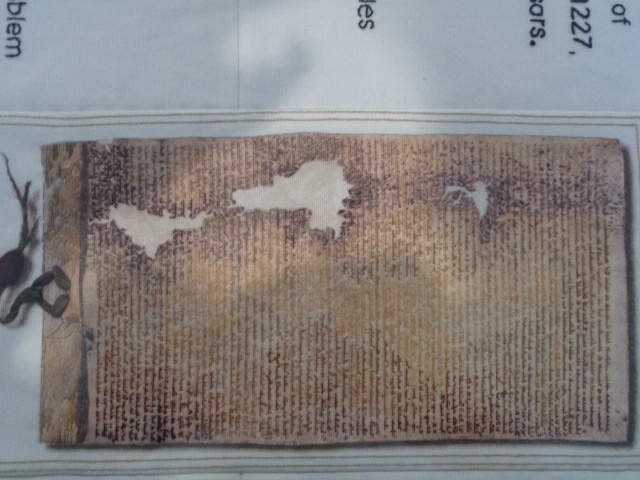 To celebrate Magna Carta’s 800th anniversary this year, the acclaimed British artist Cornelia Parker has replicated in stitch the entire Wikipedia article on Magna Carta as it appeared on the document’s 799th anniversary. 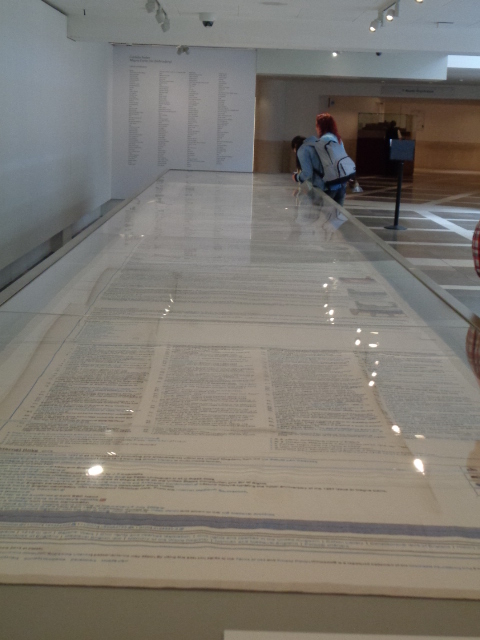 The Wikipedia article was captured by Cornelia Parker on 15 June 2014 and output it as a printed pattern on fabric. 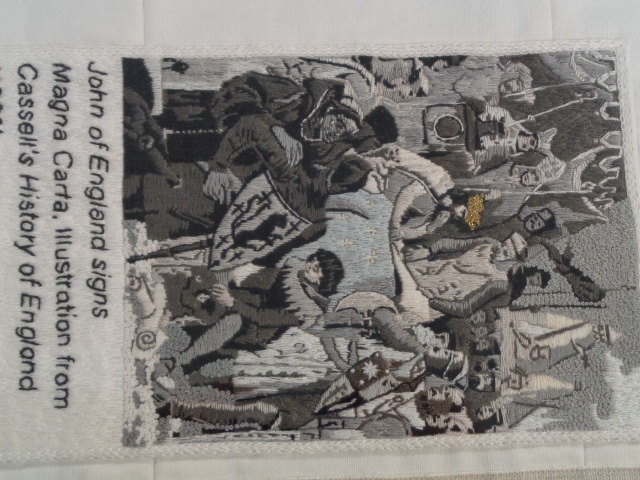 The fabric was divided into 87 sections and sent out around the country to be stitched by more than 200 people. Eventually they were sewn back together by the Embroidery Studio at the Royal School of Needlework. The finished piece is almost 13 metres long. 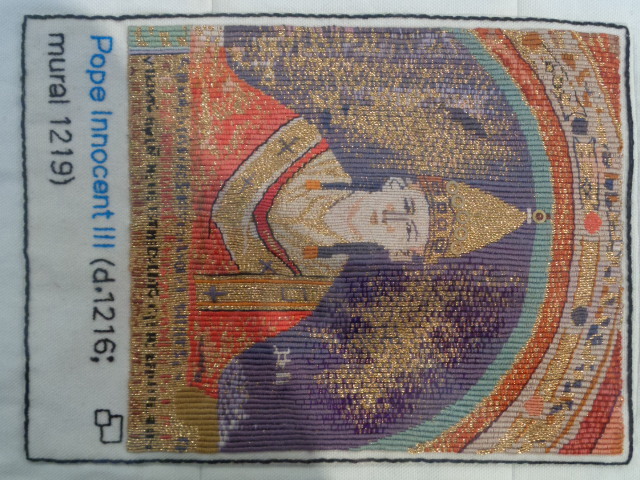 It is a really amazing piece of work, partly because so many people created it and the embroidery is not perfect! There are however detailed pictures emblems and logos scattered along one side. These have been stitched by highly accomplished members of the embroiderers Guild. 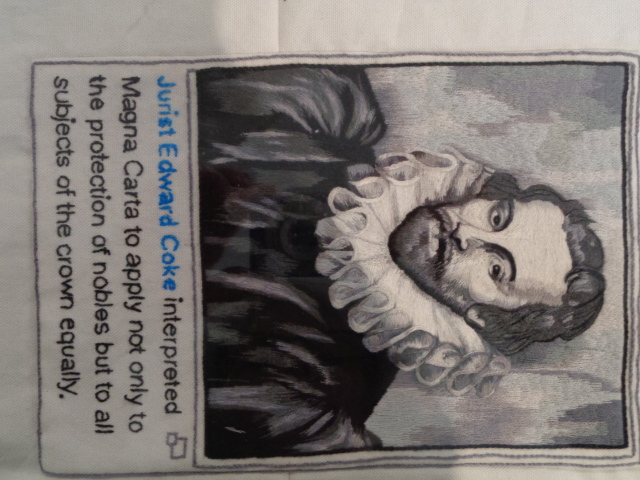 Jurist Edward Coke interpreted Magna Carta to apply not only to the protection of nobles but to all subjects of the crown equally. Now The Tapestry element. Its a loose connection, or thread, here! I was taken to the Carole King Musical “Beautiful” at the Aldwych afterwards! I sat there entirely mesmerised and immersed in my youth! And the Tapestry thing popped into my head. I will always love all the Carole King music, what a talent, and the show did her music superb justice. Another thing to do if you are in London soon!